Choose activities the whole family can enjoy like the rolling Donut and banana boat or let us help you find a place for romantic snorkeling with your lover. Perhaps you want to get away from the crowds for some deep sea fishing. Or, maybe you want something a little more thrilling like jet skiing, parasailing or even kite surfing. 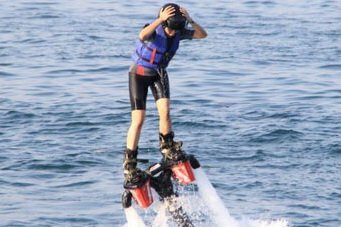 Try some of Bali’s newest water sports like the underwater walker and the water jet pack that will have you rocketing above the ocean. We’ll even arrange activities for you and your family throughout your entire vacation, scheduling a new activity every day. All you have to do is wait at your hotel for our driver. We’ll pick you up, feed you, provide memorable fun and drop you off back at your hotel. 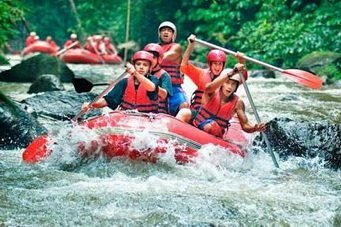 Below are some short descriptions of the different water sport activities you and/or your family may enjoy in Bali. Although in the West, we spell donut, D-O-U-G-H-N-U-T, this activity has become very popular in Bali and has taken on it’s own name as the Bali Rolling Donut. It’s nothing more than an inflatable raft pulled by a speed boat in open water. There are usually 2-4 participants in each donut. The boat can go at any speed to accommodate young children. A variation that has become quite popular is the act of increasing the speed so much that the donut actually becomes airborne. In any case the rolling donut is a safe activity for all members of the family. Bali Trekking Exploration will take you to some of the best beaches in Bali for snorkeling. The banana boat looks like a long inflatable banana and is tethered to the back of a speed boat just like the rolling donut. Participants sit one behind another and take the boat out into the bay for a ride. At high speeds, the boat can make tight turns throwing the passengers off the banana and into the water for a fun thrill. Bali Trekking Exploration will charter boats for deep sea fishing or lake fishing according to your preference. For cheaper fishing, hop on a regular scheduled boat from any one of several launch locations. You can also fish from one of Bali’s rivers or wade thigh deep alongside the local fishermen to catch something closer to shore. Check with us for rates, cleaning arrangements and charters. We’ll get you an instructor or if you think you can figure it out on your own, we’ll get you set up with the equipment and show you where to go to get started. For more advanced surfers, we’ll take you to some waves that you can catch on a SUP. Reminiscent of the early deep sea divers, this apparatus allows you to walk along the ocean floor with a helmet that looks somewhat like a spaceman’s suit. You don’t need to be a certified diver to see colorful fish and sparkling coral underwater with the water walker. Your body harness is attached to a parachute, but your tether is attached to a speed boat. As it takes off, you immediately gain altitude and soar above the earth looking down from 50 meters above. The boat pulls you along until it slowly reduces speed and you gently float back to earth. Parasailing is not for those who are afraid of heights, but is quite thrilling as you dangle from above gazing at the horizon for miles around. You’re on top of the world! Speed on the water is the name of the game here. Ride one yourself or go tandem. Think of a motorcycle on the water. Jump wakes, make hairpin turns and race each other from one end of the beach to the other. Children can ride these machines as well, but must be accompanied by an adult. Life vests will be worn ball all. Remember the jetpacks we were promised in the 70’s? Well, they’re here. As water is pumped up from a tube, the force thrusts the user up into the air about 5-7 meters above the surface of the water. Controls allow you to move back and forth and even into the water and back out again. You have to see the water jetpack in action to really understand how much fun it can be. Do it once and you’ll want one for yourself when you get back home. This is a tough sport and is only recommended for those who are athletic in nature and have patience. It normally takes at least 3 lessons to get the hang of it. Once you do, however, you’re off and surfing, even without waves. All you need is wind – a lot of wind. 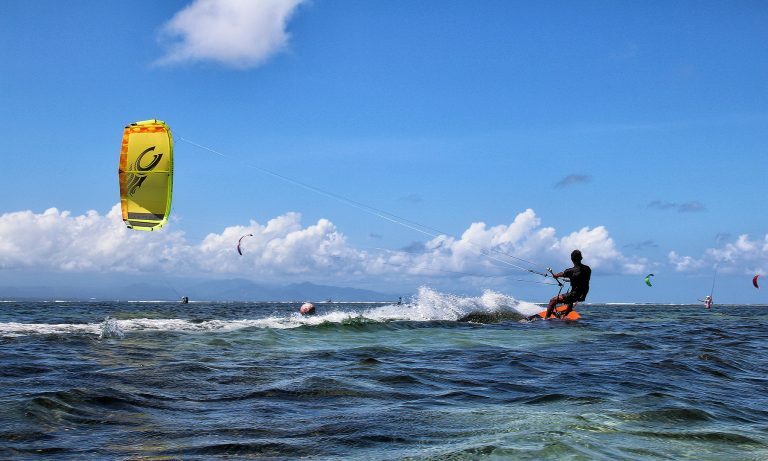 Kite surfing is not available in all areas or times of the year as it depends on strong winds to be effective. Ask us about kite surfing and we’ll give you all the details you need to decide if this activity is worth it during your vacation. There are more water sports in Bali than perhaps anywhere else in the world. We didn’t even mention Bali’s favorite water sports, surfing and scuba diving. If you need help arranging dives or need a local guide to show the best places to surf in any given season, let us know and we’ll get you hooked up. We’ll even help you arrange lessons for both. Please note: Due to the personal nature of this trek and because we do not join with any other travel groups, we must insist on a 2 person minimum. If you still want to book this package as a solo traveler, we will add an additional 50% charge to this booking fee. We understand that you have invested a lot of time and money in your trip to Bali. We want to help make your vacation as enjoyable as possible and we are excited to share with you our beautiful island along with all of its fun activities. We understand that a careless accident can impact your vacation in a negative way. Therefore our drivers are all licensed and drive safely to and from your destination. Our guides are experienced and knowledgeable, knowing the hazards and risks with each activity as well as the limitations of our guests. For your safety we will always err on the side of caution. Can you plan a new activity for me and my family each day of our vacation? Yes. 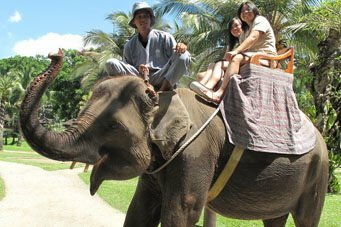 We love doing this for guests because it gives us a chance to introduce you to many fun and exciting activities in Bali. Just fill out the web for and let us know you want a custom package and we’ll make recommendations and give you a custom price with discounts for multiple bookings. Is it necessary to hire a local guide for all these activities? Of course you can do many of these on your own, but because we arrange so many activities, we can often get discounts that you wouldn’t receive if you were to book on your own. We also make sure you receive quality instruction and licensed guides. Furthermore, all our activities meet a level of safety standards that not all outfits comply with. Finally, the waves can get big in Bali and the sea can be rough. We know when it’s too dangerous to play in the water and where the danger lies. Stick with us and you’ll be protected. As members of the Bali Tour Guides Association, we are required to train our guides on basic first aid, safety standards and rescue procedures. If there is an accident, a medical team will be dispatched and an ambulance called if necessary. The injured person will be taken to the nearest hospital and the next of kin will be notified. We’ll insure you always receive quick and appropriate medical attention. Can you take us to where there are few tourists? Yes, we know places with few crowds, yet are still enjoyable for guests. Are there crocodiles, sharks or sea snakes in Bali? Bali has no crocodiles and there are very few sharks here. Though there is the rare shark encounter, the local waters have been overfished so sharks rarely visit the area. As for sea snakes, you may see them, but they are non aggressive and avoid humans. They are more afraid of you than you are of them. Furthermore, poisonous sea snakes have such small mouths that it is nearly impossible for them to bite a human. What about other dangerous sea creatures? There may be the occasional jelly fish or sea urchin, but Bali is an extremely safe place to play in the water as long as you stay away from the big surf. Overwhelmingly more injuries occur due to safety violations rather than from sea life. Surfers have been known to get pretty scrapped up on the coral, but that’s because they surf in advanced surf locations. Again, our guides consider your safety their number one priority and are continuously looking out for you, even when you aren’t. You’ll be safe as long as you’re with us.